Neurangiosis is used to designate inherently functional but different in origin and symptoms vegetative disturbances caused by the impaired neurohumoral regulation of the vegetative function. This kind of disturbances usually occurs during neuroses, hypodynamia, endocrine disharmonies during pubertal and climacteric periods, as well as neurosis-like states caused by neuropsychic or physical overwork, infections, intoxications, abstinence (in case of toxicomania), etc. The neurangiosis pathogenesis usually deals with impaired regulation of the vegetative activity at all levels - from the brain cortex to the peripheral segments of the vegetative nervous system (including adrenal- and cholino-receptors of the executive organs), as well as endocrine regulation segments. However, depending on the neurangiosis form and aetiology, the principal pathogenetic value for any level - cortical, subthalamic, etc. - can be specified, with the primary activity of either the parasympathetic or sympathetic vegetative nervous system segment. The majority of patients have some form of asthenia or other - fatigue, irritability, a sleep disturbance, a low pain sensitivity threshold with different by cenesthopathy (a sensation of insufficient breathing, cardialgia, a burning sensation in different parts of the body, etc.). We had an opportunity to see and treat many patients diagnosed with neurangiosis in our clinic during the last seven years. We are offering colonic irrigation and tried various colon hydrotherapy options to ease symptoms of neurangiosis. In half of the cases, we had no responses, but in the other half, the reactions were positive. Statistical data, which accumulated in our practice, has let us empirically develop the best combinations of the colonic's options for those who suffer from the neurangiosis pathogenesis. The ideal pattern of colonic treatments would include a minimum of six alkalising colon hydrotherapies with sodium bicarbonate, an anti-parasitic implant on the first treatment, four liver and gallbladder stimulating herbal implants on the second, third, fourth and fifth treatments, and the probiotic implant on the final colonic. An intensive course of three colonics with bicarbonate of soda taken over one week to kick-start a detox cleansing regime. It includes initial consultation. 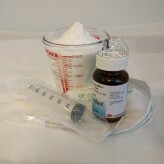 Colon cleansing with ENEMA HERBS & bicarbonate of soda - Highly anti-spasmodic and helping to void gas during colon hydrotherapy, especially in the presence of IBS and spasm. It includes initial consultation. The ideal pattern of colonic treatments includes three alkalising colon hydrotherapy treatments with sodium bicarbonate, one anti-parasitic implant on the first treatment, one liver and gallbladder stimulating herbal implant on the second treatment, and high strength probiotic implant on the third colonic.